It has been a while since I got to spend some time on the river chasing trout. I had a couple outings after work trying to catch some warm water fish (crappies, bass, etc.) but unfortunately the ponds close to home were fishing rather difficult. The only memorable moment was when a big fish grabbed a 3" largemouth bass struggling at the end of my line. I never saw the big guy though but the bend in my Iwana 12' was impressive. Back to trout fishing: I was able to head back to Bear Creek on Sunday July 31st. Flows have come back to normal from when the river was blown out by daily thunderstorm precipitation on the Front Range. 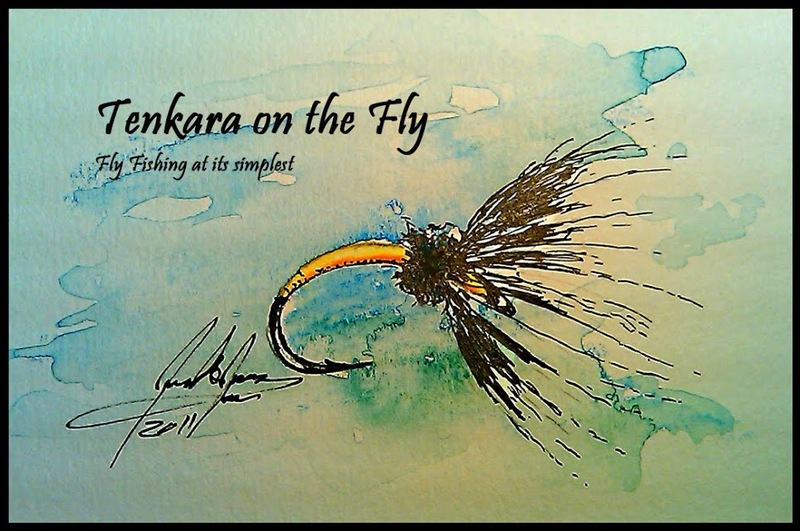 I posted that I would go early Sunday morning for a few hours on Facebook's Colorado Tenkara Anglers and sure enough, Graham, our new guest blogger, took the bait. The fishing was tough, there was insect activity (mostly caddis) but barely any surface activity. Knowing that at this flow fish would be looking up, we both decided to start with dries. Graham later switched to a RS2 only to switch back to a dry again. I tied on a foam body and Elk wing Yellow Sally but realized that it was too big, so I changed to a size 16 yellow CDC & Elk but still, the action was fairly slow. Only after I tied on a size 16 CDC & Elk on a emerger hook (TMC 2488) things started to pick-up a bit. We were able to entice quite a few fish to rise & splash but we were able to hook only a few, compared to previous trips on Bear Creek. However, I am glad to report that Graham was able to hook and land the fish of the day; a beatiful brown trout. Turns out he can safely catch & release both trees and trout. Between the two of us, we landed 8 brown trout. Come on, show off that monster! We called it a day around noon since both of us had other "real life" responsibilities to tend to.